A fruit chewy bite-sized candy with a colorful candy shell, Skittles candies have been enjoyed by fans for decades. It’s now available as a great gift as well. The Tin serves as a nice decoration andRainbow container at the same time! 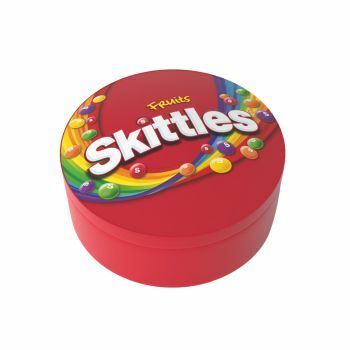 The tin contains 195g of Skittles Fruits flavored candies in a handy pouch. Share the Rainbow, Taste the Rainbow.